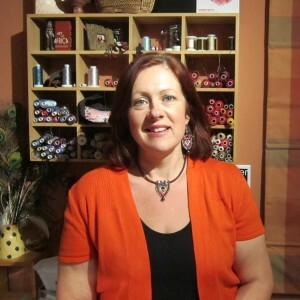 Janice graduated from the College of Art in Belfast in 1989 and launched her business Pageant Jewellery in 1990. She creates her jewellery and embroideries using a combination of hand beading and machine stitching. A sewing machine is used to build up interwoven layers of stitch forming the designs which are worked onto either vanishing muslin or dissolvable fabric. Fine beads are then hand stitched to the jewellery creating a rich and decorative finish. Janice is inspired by a variety of influences including Islamic Architecture, Persian Kilims, Heraldry, the Book of Kells and Elizabethan costume. The arts and crafts of various cultures have also inspired her while travelling in countries such as India, Morocco and Turkey. She is as much inspired by the materials which she uses as by the subject matter which provides the impetus for her designs. The creative tension between pre-planned designs and what happens in the making determines the end result and the design can often change considerably from that which she first imagined. As well as selling her jewellery in the UK and Ireland, Janice has exhibited her work extensively in international exhibitions and galleries including venues in Japan, Italy, America, UAE, Germany, Finland and Norway.